After a 1-2-3 first inning on Sunday for Rafael Montero, the second- and third-inning looked rather recognizable. He was just missing off the edge, falling behind in counts, and giving up hard contact. In that third inning, though, he appeared to turn a corner. To set the scene, Montero had just issued a five-pitch walk to Hunter Pence. This walk loaded the bases with one out in the bottom of the third, though Montero had yet to surrender a run on the afternoon. Following the base on balls, Mets’ pitching coach Dan Warthen took a trip to the mound to have a talk with his starter. While I won’t speculate on what was said, I do have this to report; Rafael Montero was phenomenal from that point on. The very next batter was Buster Posey, who ended up knocking in (via sacrifice fly) the only run Montero would surrender on the day. Brandon Belt was up next and, while his official trip to the plate had to wait until the following inning thanks to Pence being caught trying to steal second base, the appearance featured some very impressive sliders. In Belt’s official trip in the fourth inning, Montero gave him fits with another one of his offspeed offerings that was working all-day — his changeup. All told, Montero looked strong after that trip to the mound in the bottom of the third, retiring six straight between the fourth and fifth innings and striking out five in the process. The sixth inning didn’t go as great following a leadoff walk and a single, but a soft fly ball from Buster Posey turned into a double play and that was all there was to it for Rafael Montero, who went 5.2 innings, allowing five hits and two walks while striking out seven batters. This puts us in a weird position, right? One of the things that has become rather apparent these past few seasons is that Rafael Montero is…bad. And that would be putting it nicely. But if you look at how he has pitched in 12.1 innings since returning to the major leagues, Montero has struck out 15 and only walked four. Over that span, which includes a relief appearance against the Washington Nationals and Los Angeles Dodgers, he has allowed just two earned runs. So, at this point, what we have is a lot more questions than answers. If Montero has truly turned a corner and is looking to prove to Met fans everywhere that he can change the narrative, he is going to have to do it against someone better than *checks clipboard* the actual worst lineup in Major League Baseball. Time will tell, but if Montero can keep it up this might develop into one of the few bright spots for a now-on-the-market Metropolitan roster. You have to assume he’ll get at least one more start, which will likely come against the Philadelphia Phillies. The Phillies don’t have an incredibly potent lineup, so Montero could be poised to build on this outing. The fact that the Mets are now admitting that they are out of it affords them an ability to give Montero a couple starts or another look in the bullpen. When you’re not playing for wins, you’re playing to see who can help you play for wins next year. Figuring out whether Rafael Montero factors into the equation for 2018 looks to be a question the Mets will try and answer in the coming months. I wasted a lot of time on Rafael Montero, but here is another oddity about this game — Rene Rivera hit two home runs. I don’t really have much else to say here, other than Rivera’s first multi-home run game almost doubled his season home run total (he began the day with three home runs this season). It was a good day for about everyone with a Mets uniform to have a bat in their hand. Seriously, what the hell happened. This game featured Rene Rivera hitting two home runs, Rafael Montero having a strong start, and a multi-hit game for seven of the Mets starting eight non-pitchers. In total, the Mets recorded 14 hits as they hit Matt Moore around, and did the same with the Giants bullpen. I guess the answer to ‘what the hell happened?’ is just that they played the Giants. This is the saddest ‘where are they now?’ update of the members of the 2016 National League Wild Card game ever. 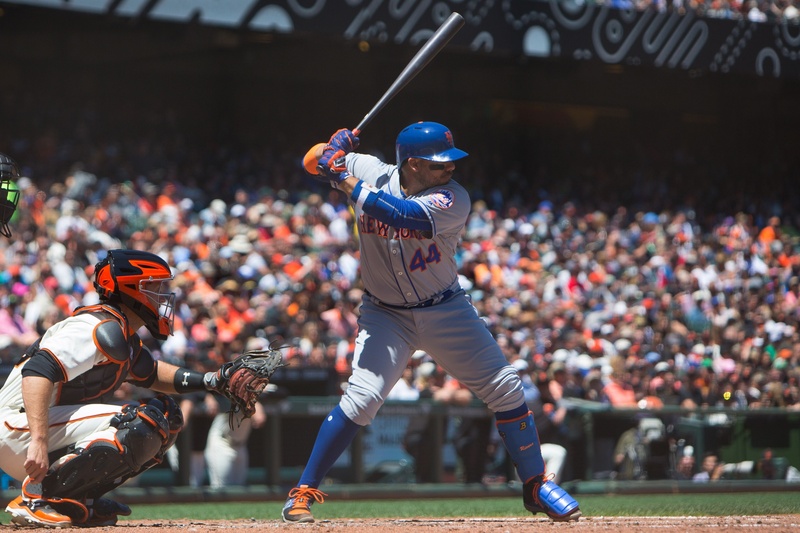 The Mets get to enjoy their series sweep of the San Francisco Giants with a travel-day as they prepare for a mid-week series against the Miami Marlins.